There are numbers of Virtual Assistant Companies who provide Free Virtual Assistance Services for 1 hour, 2 hours and it can be maximum 3 hours – but I have seen few VA services providers offering a good amount of hours as a free trial. Offering a Free Trial Virtual Assistance Services for more than 1–3 Hours is not a good idea – not only for the Clients but also on Virtual Assistant Companies as it imposes a negative impact on them. Here is why…. They are new in this field. They are trying to grab clients. They may not available for 24/7 to work on your preferable time-frame. The quality of services is not as good as expected. The last point, “The quality of services is not as good as expected” to be noted. If you agree to work with a low-quality service, you are free to choose those VA providers who offer a huge discount. Why do you want a Virtual Assistant and what do you expect from them? You are hiring a VA just because you are too busy to handle all of your works. You are hiring a VA by expecting that they are expert to do your works or solve your problems. You are hiring a VA just because you can contact them at any point of time and they will be available to help you. So, you want them to be available for 24/7. You are expecting a Quality Service while hiring a VA. These are the basic requirements which you may think about before hiring a Virtual Assistant. So, the conclusion is that you are just considering quantity over quality, that doesn’t make any sense. Giving a free trial is a nice option to let clients know about your expertise so that clients can make sure about the quality before going for any of your paid plans. You can give an offer to clients to check your services for 1 hour to 3 hours maximum based on the requirements of the tasks. When they are satisfied, you can ask them to choose a paid plan as per their requirement. Why it is not a good choice to give huge numbers of the Hours as a Free trial to your clients? If you are providing a huge amount of hours as a free trial, they may just use your services and leave. After using the Free trial for bulk hours, they can say, “I am not satisfied with your work and quality” where you have given your best and now you have nothing to do. It can also happen, a client has only 7–8 hours of work to do and they choose your 10 Hours free trial. Do you think, will they subscribe for your paid plan? Or it can happen that a client has lots of work to be done, it can easily be done without any investing by creating multiple email id’s and subscribing for the free trial. It may also happen any other Virtual Assistant company uses your Free Trial to get their job done without your knowledge. I am running WERVAS Virtual Assistant Services for last 1.5 years and I have 5 years of experience in the Virtual Assistant field. Based on my personal experience I am sharing these suggestions. Don’t offer any Free trial of VA services for more than 3 hours. Ask your clients to provide all details about their process and tasks. Just work on 1 or 2 tasks or 1–3 hours depends on the requirements of the task. If the client is really serious about to hire a Virtual Assitant,1 or 2 sample tasks is enough to prove your quality. Charge a minimum amount($1 or $2) for Free trial. By charging a minimum amount, you are avoiding spams. If you are looking for the Best Affordable Virtual Assistant with all kind of expertise, you can choose WERVAS Virtual Assistant Services. 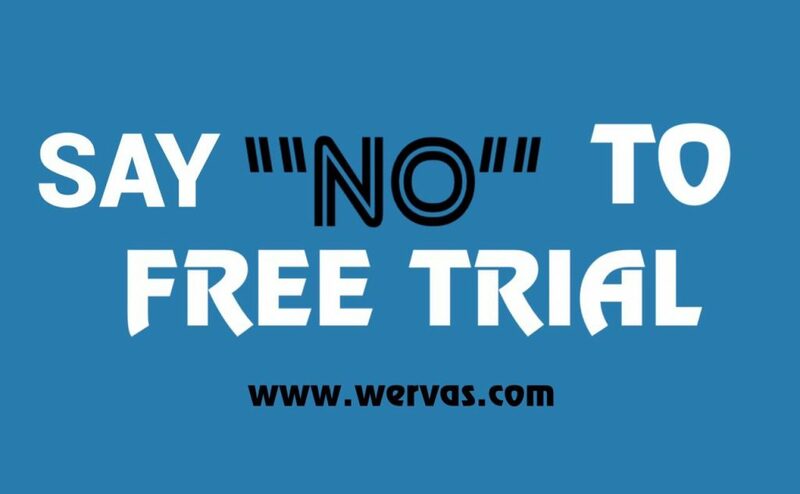 WERVAS provides a Free Trial Plan but that is not fully free of cost. You just need to pay $1 to subscribe for the Free Trial. This Free trial Is just to check our Quality, Expertise, communication, etc. You are free to shoot any question if you have on your mind! 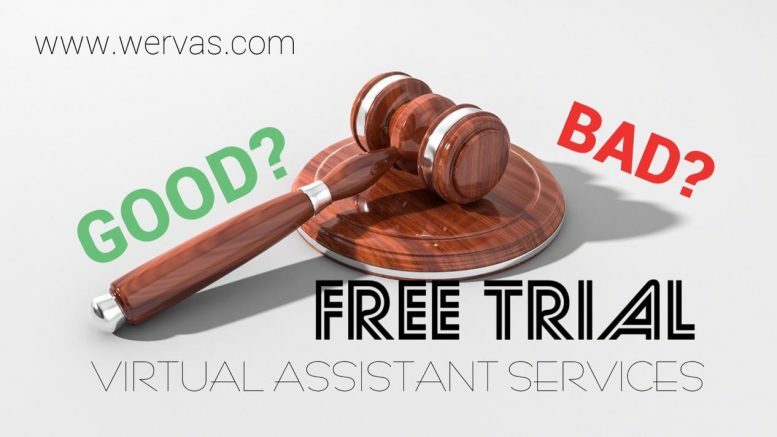 Be the first to comment on "Free Trial On Virtual Assistant Services | Good Or Bad?"